Need some help with your homework? Looking for SAT or ACT practice tests? If you answered “yes” to either of these questions, then Brainfuse: HelpNow is the perfect database for you! Brainfuse: HelpNow is a free, online platform that offers homework help for any grade and any subject, test prep help, and study tools. Live, online tutors are available for free or you can study independently or in a virtual study room with peers. You can access Brainfuse: HelpNow at the library or from home with a valid FRVPLD card. 1. From the library's homepage, click on "Research"
2. You'll get a list of eResources in alphabetical order. Scrol down to the "Bs" and click on "Brainfuse: HelpNow"
3. If you're accessing from home, you will be asked to type in your library card number at this point. Then you'll be taken to the Brainfuse: HelpNow homepage. Accessing at the library takes you right to the homepage. 3. Choose a username, password, and security question then click “Next” and you’re good to go! 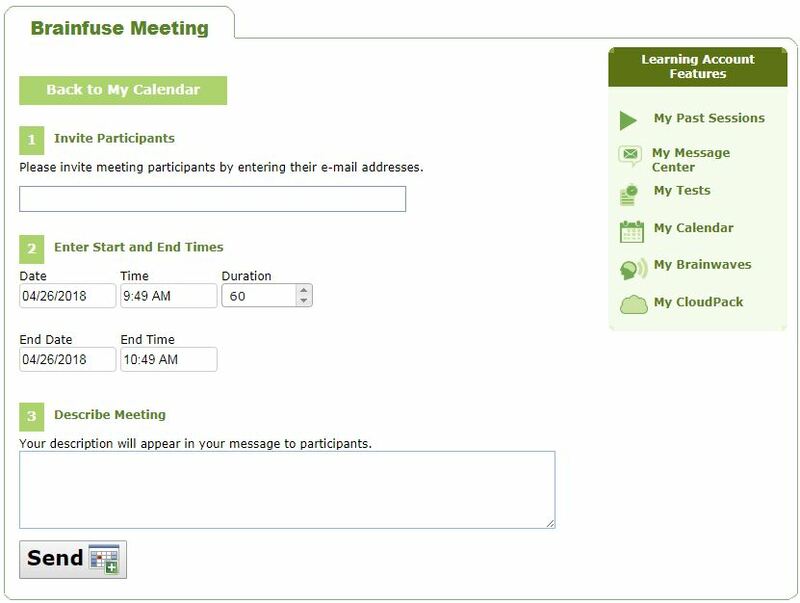 Let’s take a look at the powerful services and tools that Brainfuse: HelpNow has to offer and how they work. One of the main parts of this database is the SkillSurfer section. You can get to this section by clicking on "SkillSurfer" on the left column on the Brainfuse: HelpNow homepage. SkillSurfer provides a collection of lessons, exercises, videos, practice quizzes and tests, and more. Content is categorized by grade and subject area. There are also categories that cover various kinds of tests, including: the SAT, the ACT, AP exams, the GED and more! If you click on a category and then a specific subject area or type of exam, you’ll be given a list of lessons, videos, exercises, practice quizzes and more. They are set up in a way where you can progress through and build up your skills and knowledge. 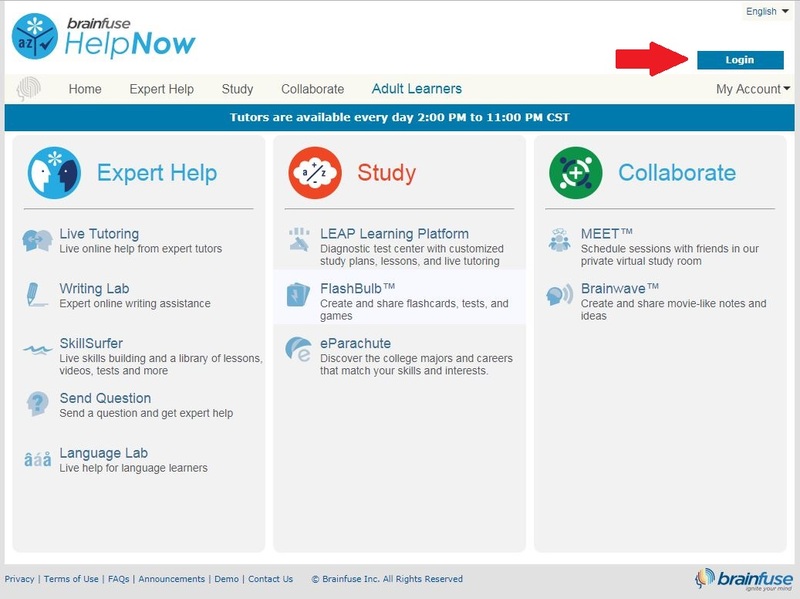 Another exciting feature of Brainfuse: HelpNow is that you can connect online with a tutor for free! Brainfuse: HelpNow offers free tutoring for all grades and subject areas. Tutors are available 7 days a week from 2 pm to 11 pm, central time. Brainfuse employs a team of over 2,500 tutors. All tutors have a bachelor’s degree and 3 or more years of teaching experience and 91% of tutors have a graduate degree. 1. 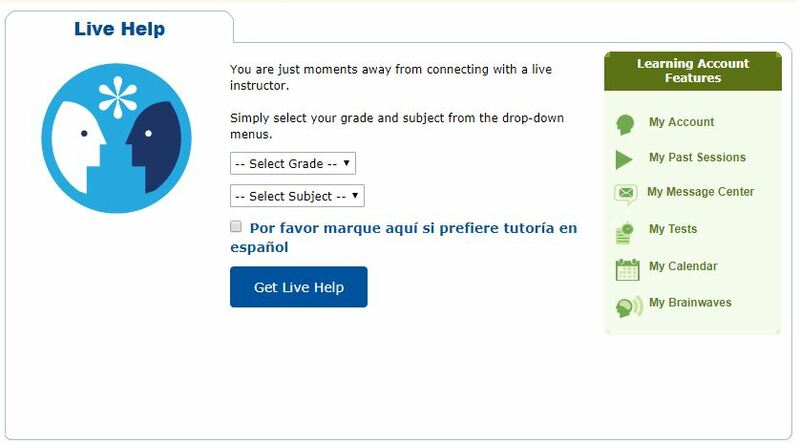 Click on "Live Tutoring" on the left side of the screen. 2. Choose a grade level and then a subject area. 3. 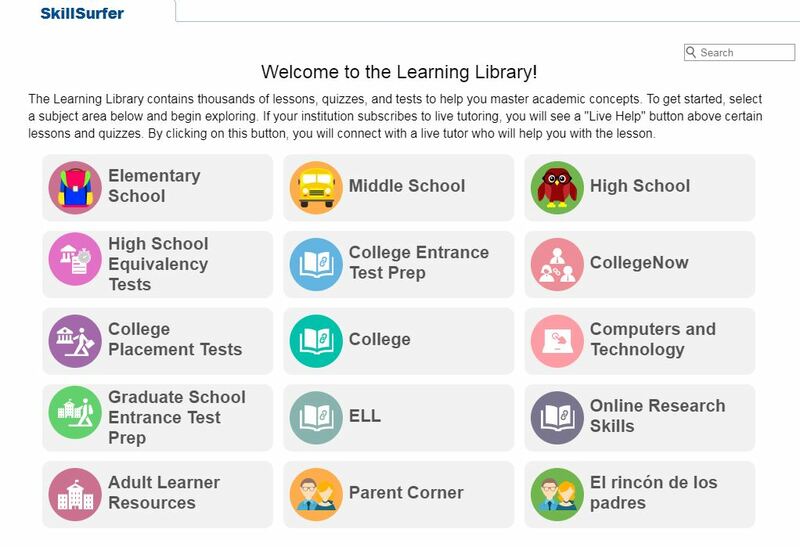 Click on "Get Live Help"
You will then be in a chat room that is set up to be a virtual study room and a tutor will connect into the room with you right away. You can work with the tutor using your own homework, practice questions, etc. or with any of the content within Brainfuse: HelpNow. The study rooms have a virtual whiteboard, a chat box, and various tools (i.e. graphs and shapes for math). Audio chat capabilities are available as well. These are just a few of the many features availabe through Brainfuse: HelpNow. Be sure to go to Brainfuse: HelpNow and check out everything it has to offer! Brainfuse: HelpNow is an extremely useful database that is available for free for FRVPLD card holders. It can be accessed in the library and at home as well. Have questions, want more information, or want help using Brainfuse: HelpNow? Please stop by the Information Desk, call 847-428-3661, option 3, or send an email at LibraryHelp@frvpld.info and we’d be happy to help you!